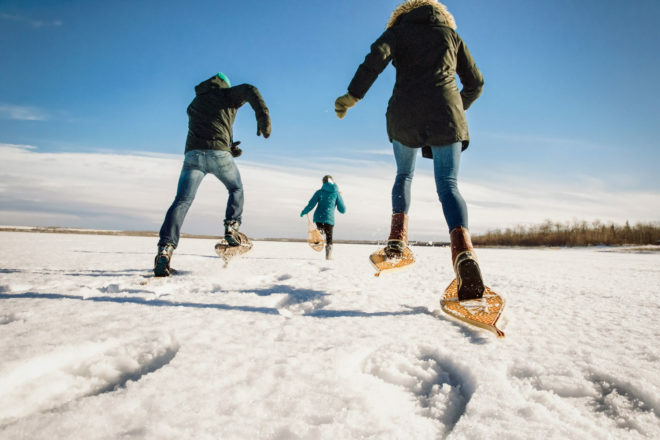 Snowshoeing: This is another activity available at most snow resorts. 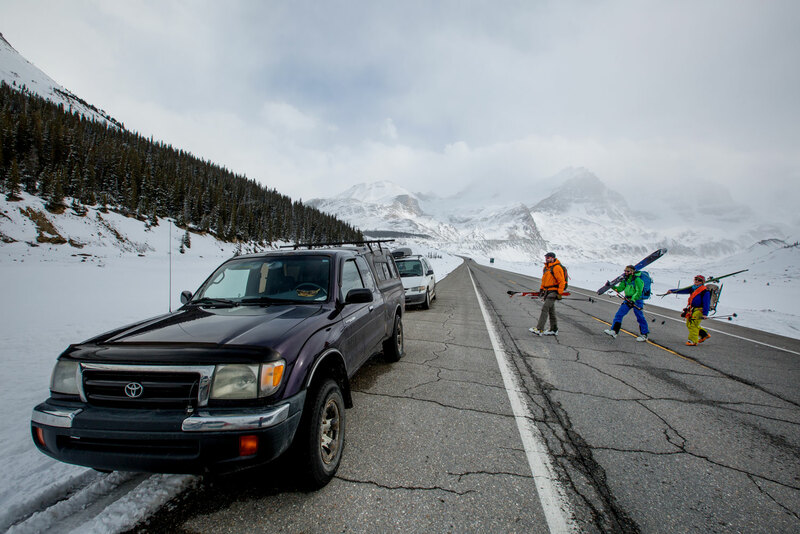 It’s easy to do and tours include anything from a few hours to longer excursions that take you into backcountry. There are many operators in Banff National Park, including Banff Adventures, which has a range of tours, some of which will take you through canyons and forests in search of moose and wolf tracks. 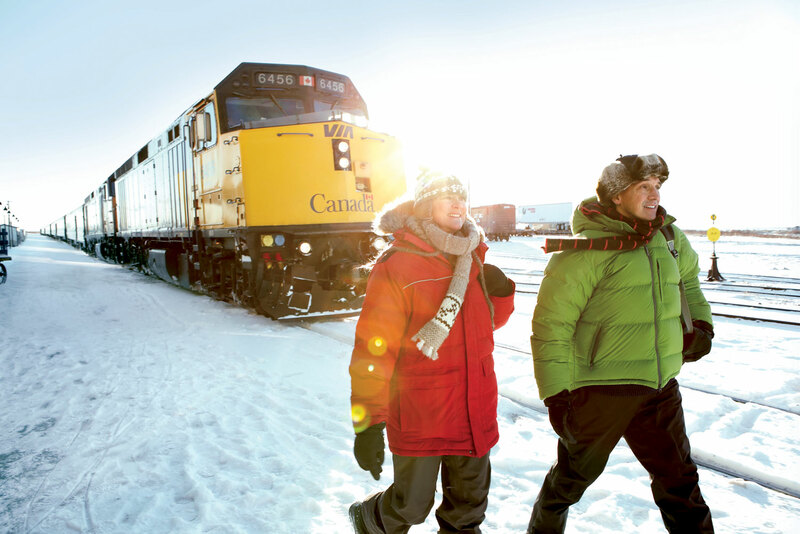 Take the train: Arrive in the mountains in style, on VIA Rail’s snow train. The overnight journey from Vancouver to Jasper includes luxurious service and amenities, a sleeper cabin with comfortable bed and on-board meals. Travel is in original, stainless steel ‘streamliner’ rail cars that have been refurbished. There’s a café car and a lounge car, as well as the dome car that provides great viewing through rooftop windows as the train moves through the mountains. Athabasca Glacier and Columbia Icefield: If you’re in Jasper or Banff, you’re within striking distance of these natural Canadian wonders. The glacier and icefield are next to the Icefields Parkway (Highway 93) between Lake Louise and Jasper. The glacier is one of the most accessible in the world (it spills right down to the highway), but don’t walk on it unless you’re on a tour with a guide. Northern Lights: The great colour show in the night sky called the Northern Lights, or aurora borealis, can be viewed from several locations in Canada, including the ski provinces of Alberta and British Columbia. The lights can be seen from Calgary, one of the key gateway towns for skiers, or head further north to increase your chances. Aurora Village, at Yellowknife in the Northwest Territories, claims there is a 95 per cent chance of seeing the lights dance across the sky during a three-night stay. Additionally, the village has winter experiences such as dog sledding, guided snowshoeing and snowmobiling. 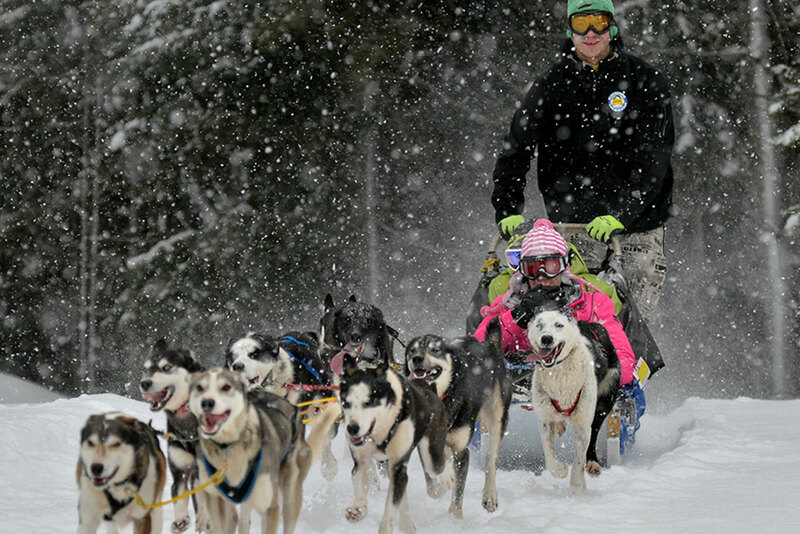 Dog sledding: This is tail-wagging good fun and available at most snow resorts. Sit back on the sled and enjoy the ride on gentle trails, or mush your own team. Blackcomb Dogsled at Whistler, has a ‘Champagne and Moondogs’ tour that goes out at night under the stars. Wrap up in warm blankets with a glass of sparkling cider as the guide shares stories about dog-sledding culture. 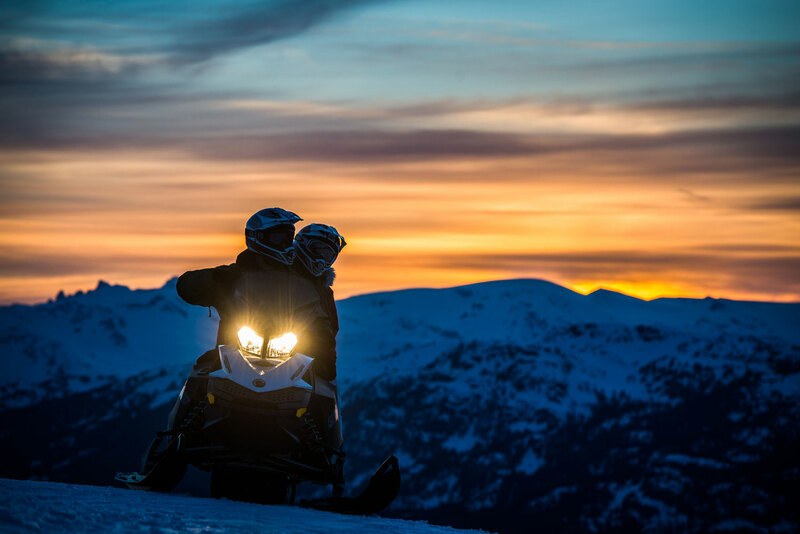 Snowmobiling: You don’t have to be a revhead to enjoy a snowmobile ride. Most resorts offer guided tours for all levels of rider ability, from family cruising right through to powder-riding. Go day or night. Big White resort has rides from one hour to four hours, including a twilight tour that finishes with hot chocolate and a marshmallow roast around a fire. Ice hockey: Canada’s national winter sport is fierce and fast. Local games are played at towns close to snow resorts, or you can go and see the big league. If you’re at Big White, Revelstoke or SilverStar, check out the Kelowna Rockets playing in Kelowna. 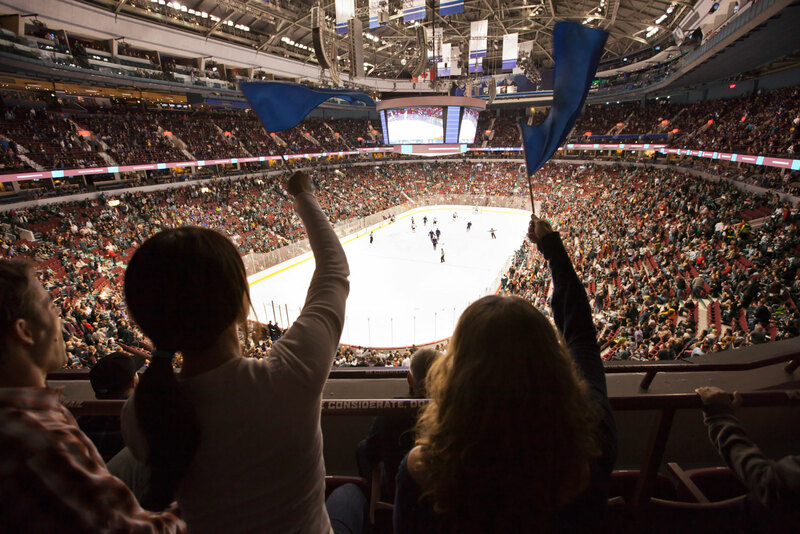 There are organised tours from Banff to watch the Calgary Flames in the NHL, and from Whistler, there are tours to watch the Vancouver Canucks, also in the NHL. The tours depart about 4pm for the evening games and include tickets as well as return luxury coach. Wildlife viewing: Bears are in hibernation during most of the snow season but, if you’re spring-skiing at Blackcomb Glacier, there is a chance for some bear-viewing. Whistler Blackcomb has a population of about 60 black bears. Sometimes you can see them from the gondola or, to get a better look, you can take a guided tour. Whistler also has tours to see bald eagles. 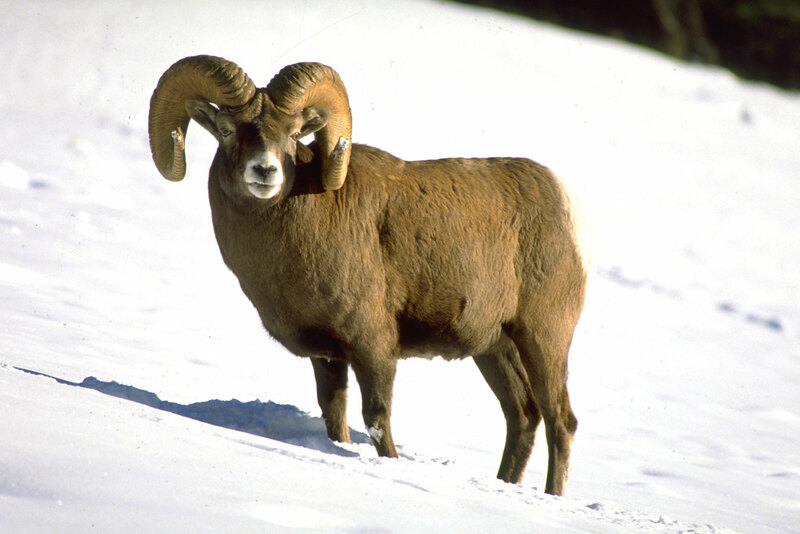 Several companies, such as Discover Banff Tours, conduct winter wildlife excursions to see elk, bighorn sheep, moose and deer in Banff National Park. An hour from Banff, you can see wolves at the Yamnuska Wolfdog Sanctuary and, at Kicking Horse, visitors are welcome at the Northern Lights Wildlife Wolf Centre. Bears are in hibernation during most of the snow season but, if you’re spring-skiing at Blackcomb Glacier, there is a chance for some bear-viewing. Whistler Blackcomb has a population of about 60 black bears. Sometimes you can see them from the gondola or, to get a better look, you can take a guided tour. Whistler also has tours to see bald eagles. Several companies, such as Discover Banff Tours, conduct winter wildlife excursions to see elk, bighorn sheep, moose and deer in Banff National Park. An hour from Banff, you can see wolves at the Yamnuska Wolfdog Sanctuary and, at Kicking Horse, visitors are welcome at the Northern Lights Wildlife Wolf Centre. 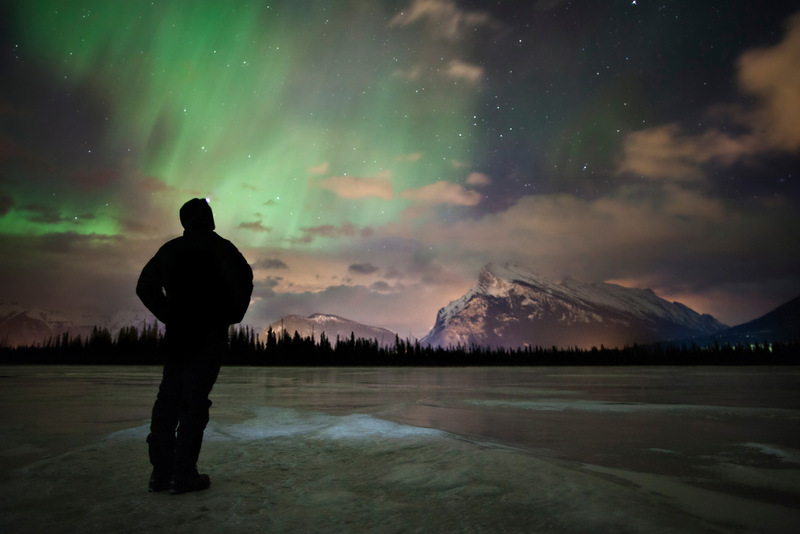 The great colour show in the night sky called the Northern Lights, or aurora borealis, can be viewed from several locations in Canada, including the ski provinces of Alberta and British Columbia. The lights can be seen from Calgary, one of the key gateway towns for skiers, or head further north to increase your chances. Aurora Village, at Yellowknife in the Northwest Territories, claims there is a 95 per cent chance of seeing the lights dance across the sky during a three-night stay. Additionally, the village has winter experiences such as dog sledding, guided snowshoeing and snowmobiling. This is tail-wagging good fun and available at most snow resorts. Sit back on the sled and enjoy the ride on gentle trails, or mush your own team. Blackcomb Dogsled at Whistler, has a ‘Champagne and Moondogs’ tour that goes out at night under the stars. Wrap up in warm blankets with a glass of sparkling cider as the guide shares stories about dog-sledding culture. This is another activity available at most snow resorts. It’s easy to do and tours include anything from a few hours to longer excursions that take you into backcountry. There are many operators in Banff National Park, including Banff Adventures, which has a range of tours, some of which will take you through canyons and forests in search of moose and wolf tracks. Canada’s national winter sport is fierce and fast. Local games are played at towns close to snow resorts, or you can go and see the big league. If you’re at Big White, Revelstoke or SilverStar, check out the Kelowna Rockets playing in Kelowna. There are organised tours from Banff to watch the Calgary Flames in the NHL, and from Whistler, there are tours to watch the Vancouver Canucks, also in the NHL. The tours depart about 4pm for the evening games and include tickets as well as return luxury coach. Arrive in the mountains in style, on VIA Rail’s snow train. The overnight journey from Vancouver to Jasper includes luxurious service and amenities, a sleeper cabin with comfortable bed and on-board meals. Travel is in original, stainless steel ‘streamliner’ rail cars that have been refurbished. There’s a café car and a lounge car, as well as the dome car that provides great viewing through rooftop windows as the train moves through the mountains. If you’re in Jasper or Banff, you’re within striking distance of these natural Canadian wonders. The glacier and icefield are next to the Icefields Parkway (Highway 93) between Lake Louise and Jasper. The glacier is one of the most accessible in the world (it spills right down to the highway), but don’t walk on it unless you’re on a tour with a guide. You don’t have to be a revhead to enjoy a snowmobile ride. Most resorts offer guided tours for all levels of rider ability, from family cruising right through to powder-riding. Go day or night. Big White resort has rides from one hour to four hours, including a twilight tour that finishes with hot chocolate and a marshmallow roast around a fire.